AS I stated in my Other Thots column in the Sept 16 issue of the Malaysian Business magazine, I am lucky to be in the company of many illustrious economic gurus and commentators. Among them Ungku Abdul Aziz Ungku Abdul Hamid, the iconoclastic former Vice Chancellor of University of Malaya, Kamal Salleh, the late Dr. Mokhzani Abdul Rahim, the late Dr Ismail Md Salleh, Rama Iyer, Thong Yaw Hong, Dr Rais Saniman, the late Dr Mahani Zainal Abidib, Dr Jomo Kwame Sundaram and the Datuk Dr Zainal Aznam Yusof. They were committed to their craft and were willing to be unpopular with the establishment by telling the truth. Despite that, many were co-opted into government committees and commissions, especially during the periods of the late Tun Abdul Razak Hussein and Dr Mahathir. But these days I hear that economists and private sector managers who are engaged by the government are behaving as badly as their political masters. They are more concerned with protecting the government’s image than telling the truth about the state of the economy. From my reading of the local press, it appears that most of today’s young economists are quoted largely for their analyses of the corporate world and the stock market. Either the media is no longer interested in socio-economic issues affecting the masses or our young economists are only interested in high-paying jobs in the banks, stock broking companies and consultancy firms. So it is heartening for me to have made the acquaintance of economist-researcher Muhammed Abdul Khalid, when he was studying for his doctoral degree at the Institut d'études politiques de Paris or in short Sciences Po back in 2008. 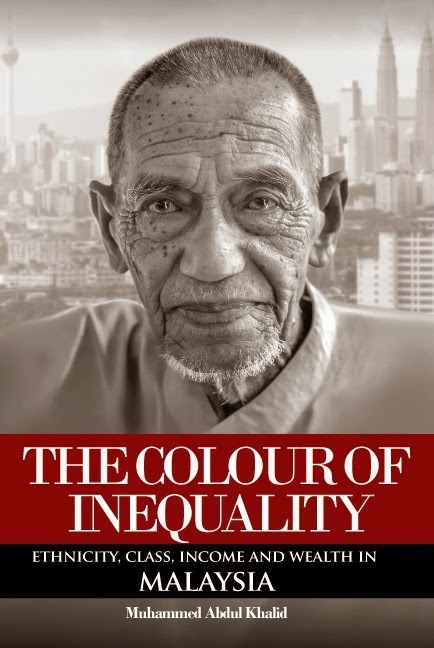 Muhammed had just published a book entitled “The Colour of Inequality – Ethnicity, Income and Wealth in Malaysia”. He, among other things, noted that, although Malaysia has made great strides in reducing poverty and inequality (especially among ethnic groups) from 1970 to 1990, the income gap remains high post-1990. In fact, he wrote, the relative income gap between urban and rural in 2012 is the same as the year Malaysia obtained its independence from the British in 1957. In terms of ethnic income gaps, the disparity has started to widen again. Since 2009, the relative income gap between the Chinese and the Bumiputeras increased by 10 per cent – unprecedented since 1970, and wiping out the gain made in the past one decade. If Malaysians still care about justice and equality as we celebrated the 51st anniversary of the formation of Malaysia, this book should encourage us to debate more openly and to find solutions to this difficult problem. Muhammed examines the unequal distribution of assets among Malaysians, with special focus on the gap between the Bumiputera majority and the non-Bumiputera minorities. His main aim is to analyze the level and distribution of household wealth by understanding its origin and evolution within three time frames – the colonial era, post-independence and post-New Economic Policy. It identifies factors, processes, and structures behind the wealth gap, especially between the Bumiputeras and the Chinese. Muhammed also examines the role of government and Bumiputera politicians in enforcing and monitoring the implementation of policies that are aimed at narrowing the wealth gap. The outcome of his research and analyses of official data points to a grim future and he made several preliminary proposals to reduce the gap before it become unbridgeable. Pre-Merdeka: Poverty in 1957 - Malays 65%, Chinese 26% and Indians 39%. Income Gap - for every RM1 the Malays had, Chinese had RM1.80 and Indians RM1.48 more. Only 9% of registered companies were Malay-owned. They owned only 1% of rubber and none in tin. Education - in 1901, only 5% of English school students in the Straits Settlements were Malays although there were 55% Malays in the school-going age. Access to school was limited. In 1938, there were 800 Malay primary schools against 1,500 non-Malay schools. In 1957, only 7% of the population had secondary education. On average, the Malayans then attended school for about 2.3 years and the Malays had the shortest. Post-Merdeka (1957-1970): Education - Malays were still lagging behind. From 1959 to 1970, for every Malay engineering graduate coming out of the University of Malaya there were 100 Chinese. In the field of engineering only four Malays received bachelors’ degree versus 408 Chinese. In 1970, there was only one Malay graduate in MBBS and engineering respectively. In 1962, Malay enrolment in faculty of engineering totaled five and the faculty of science 16. Income gap between the Malays and Chinese widened from 1.8 in 1957 to 2.3 in 1970. NEP Period: Increase in standard of living and socio-economic status for everyone, especially the Malays. Poverty was reduced significantly from 65% in 1970 to 2.2% in 2012. Ownership of equity by Bumiputeras rose from 2.4% (1970) to 23% (2012). Huge improvements in the participation of Bumiputeras in the professional field due to better educational. Income gap is reduced to 1.36 between Bumiputeras and Chinese, but widen again since 2009. Although income has increased, the majority of Malaysian has no assets and the wealth gap is gaping. More than half (53%) of Malaysians have no financial asset. The median financial asset is RM 311. The top 10% have nearly 15,000 more than the median and controls 77% of entire financial asset. Bottom 50 has only 0.01%, and bottom 80% has 5.5%. More than 70% of those without financial asset are Bumiputeras. Median financial asset for Bumi is RM1. More than 55% of Bumiputeras do not have ASB account. Average ASB investment in 2013 was RM15,402. But 72% have an average of RM554 or equivalent to 2.6% of entire fund size. The top 0.2% has 1.5 times more than the entire bottom 80% combined. The fear is this gap will continue to widen. The same happens with Amanah Saham Didik, which is open to Bumiputeras only. Based on its 2014 annual report 2014, the average investment is about RM14,500, but the bottom 86% has an average investment of RM980, while the top 0.5%, or about 1,700 kids, have an average RM 1.5 million. One in every four Malaysia has no property asset and 74% of them are Bumiputeras. Within racial groups, about 30% of Indians and 17% of Chinese have no property asset. One in every four Bumiputeras have no property asset. Current policies on taxation and education combined with the imperfections in the labor market, i.e. hiring preferences, threaten to widen the inequality further. The poor of all groups will have less upward mobility. Muhammed’s findings and conclusions require closer examination by politicians on both sides of the political chasm and by economists, socio-economic planners and administrators. We cannot dream of forging a united, progressive and inclusive nation if the wealth gaps among and with the races keep growing. Neither can we take pride in our improving GDP growth.